Did your sewing machine come with a blind hem foot? It probably did, and you most likely have a blind hem stitch on your sewing machine, too. But do you know how to stitch a blind hem on your sewing machine? It’s quick, nearly invisible, and really easy once you see how it’s done. 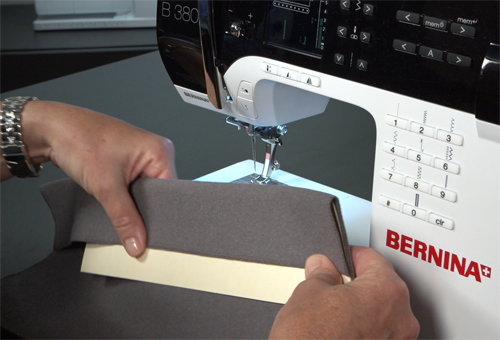 Join Connie Fanders as she demonstrates how to fold and stitch a perfect blind hem. Then you can gather up all those skirts and dress pants you never wear because they’re too long and hem them yourself – no more pricey trips to the tailor for hemming! This is a blind hem stitch – straight, straight, straight, hop to the left, straight, etc. 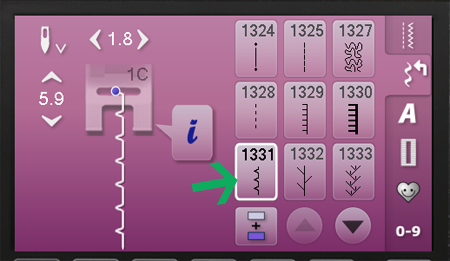 Check your owner’s manual to find this stitch on your sewing machine. 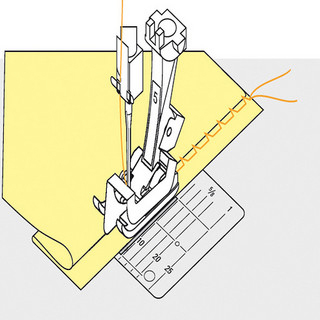 This diagram shows how the blind stitch sews in relation to the fabric and the presser foot. Note the guide in the center of the foot – this rides along the fold as the needle stitches into the hem allowance (straight stitches) and zigzags into the garment. With a permanent guide like this one, the needle position is adjusted as needed for proper stitch placement. Many blind hem feet have a moveable guide; with these the guide and fabric are moved to adjust the “bite” of the stitch. Next Next post: Are you planning to Tie One On™ on Wednesday, November 27?